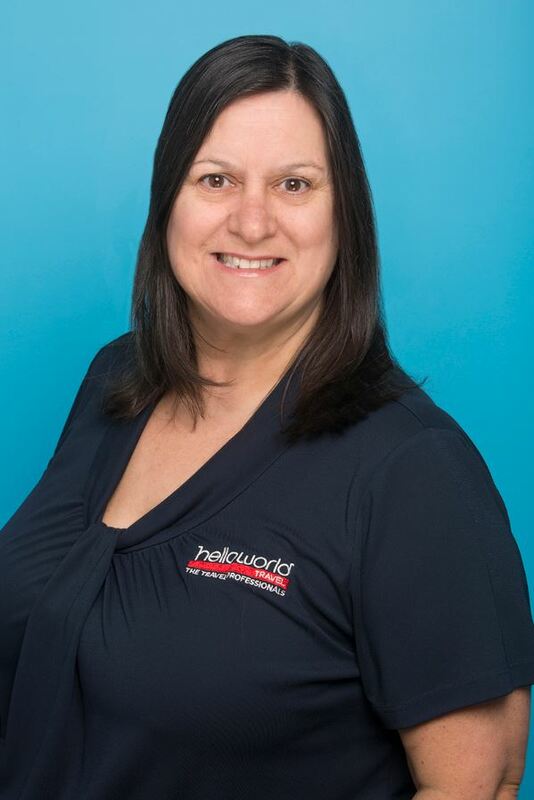 Selena is the Owner/Manager at Helloworld Travel Parkdale and with over 34 years working in the travel industry, she has a wealth of knowledge which she loves to share with our loyal clients. She has also lived in Parkdale all her life so feels blessed to be able to work and share her travel experience with the local community. Over all her years of travelling, Selena has visited many places in Australia and around the world including countries in Asia, Europe, Middle East, South Pacific, Africa and many times visiting the USA. The cities of New York & New Orleans are her favourites but spending 4 weeks in Alaska in 2011 was her holiday of a lifetime… well so far at least! Cruising is also a favourite for Selena having done many cruises over the years, recent ones being the Kimberley Coast from Broome to Darwin on the small ship Silver Discoverer, G Adventures expedition cruise around the Arctic region (complete with polar bear sightings! ), P&O to Papua New Guinea and an Avalon river cruise in Europe. Selena recently visited Sri Lanka for the first time which she loved, plus spent a relaxing few days at the beautiful Club Med Kani resort in the Maldives. In 2019 she intends on travelling back to Europe and take an Intrepid tour of Turkey, followed by a Mediterranean cruise with Celebrity Cruises on their brand new ship Celebrity Edge, an amazing new state of the art cruise ship! Besides travelling, Selena’s other passion in life is music and she often combines these 2 loves with holidays to other countries to see her favourite artists play, in particular Bruce Springsteen & U2! Selena’s top travel tip: Get to know your camera! Read the manual, play around with the settings, have a spare fully charged battery & memory card on hand, but most importantly, have it ready to shoot at all times. 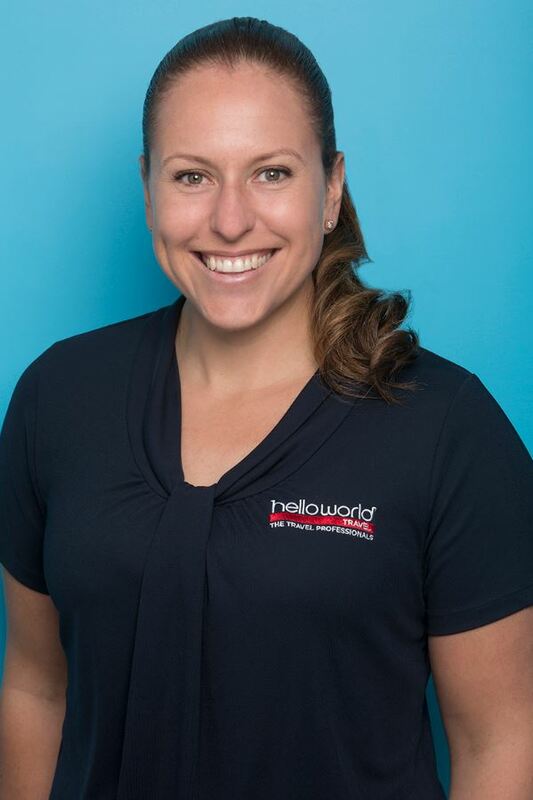 Melissa has been with our team at Helloworld Travel Parkdale since January 2017 and has over 10 years experience in the travel industry. She has previously worked at APT/Travelmarvel and came to us from an agency that specliised in cruising, so Mel is definitely our resident “cruise guru”! She has recently cruised on the beautiful Golden Princess and has taken her young family on a South Pacific cruise with Carnival. Melissa is also a specialist in organising group & family bookings but loves to book any type of holiday and takes great delight in preparing detailed itineraries and helping find the right fit for you and your holiday plans! Melissa has travelled throughout Europe, Asia, USA, Mexico, South Pacific and New Zealand both as a solo traveller and with her family. Recent trips Melissa has taken include exploring the region of Far North Queensland which she loves, spending 5 days in Hawaii checking out hotels and all that this lovely destination has to offer, and a holiday to Fiji with her partner is coming up soon! Melissa is a bit of an adventure/adrenaline junkie and some of her favourite things to do on holidays are white water rafting, abseiling, paragliding, water sports, mountain bike riding … she’s certainly not scared to get her hands dirty! And when she is not travelling, you may see Melissa out on the bay on her Stand up Paddle board or having a peaceful relaxing time at beach with her kids. Melissa’s top travel tip: When taking a cruise, make sure you remember to take along a highlighter so you can mark out what things you’d like to do on the daily activity sheet! Also it’s always a good idea to pre book your shore excursions before getting on board so you don’t miss out. 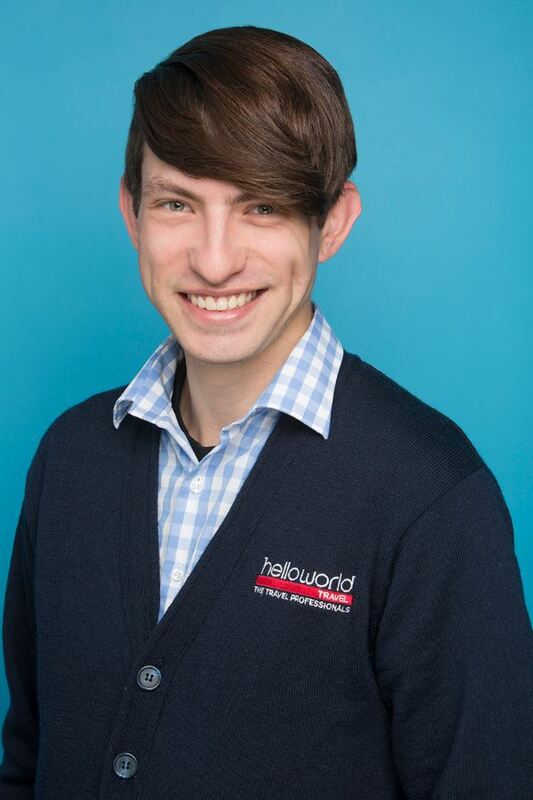 Daniel started his career in the travel industry here at Helloworld Travel Parkdale back in July 2016 after completing his Certificate IV in Travel and Tourism. Daniel is our expert for youth travel and has travelled with Contiki & Top Deck in Europe & the USA, and just recently took a river cruise in France with U by Uniworld. In 2017, Daniel took his first ski holiday to California where he visited places such as Mammoth Mountain, Lake Tahoe & Squaw Valley. He has had a very busy 2018 starting with a week in Fiji seeing lots of their beautiful resorts & hotels, then a trip to China in June with Wendy Wu tours where his highlight was seeing the pandas in Chengdu! Daniel was also lucky enough to recently travel to the Galapagos with G Adventures and absolutely loved this amazing part of the world, especially the seals! 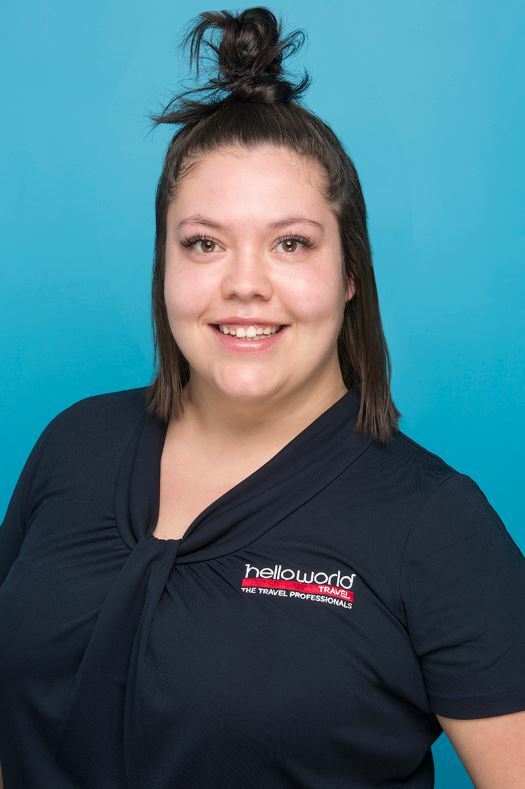 Other than travel, Daniels interests are in film, musical theatre and pugs – actually all of us at Helloworld Travel Parkdale enjoy the company of all dogs and it’s not unusual to see us out in the street greeting our canine friends! Daniel’s top travel tips: If you’re travelling to London or New York, it’s never too early to book your theatre tickets. Whilst it’s possible to get cheap tickets on the day, why waste time waiting in line only to get the leftover seats which are usually right up the back! Ebony has recently joined our team after working in the retail customer service industry for 6 years, and has just completed her Certificate IV in Travel and Tourism. She is very excited to be starting her new career in the travel industry and the opportunities it brings to learn more about other countries and cultures, plus of course she loves to travel! Ebony has visited Bali and America numerous times and has just recently spent a week in Phuket checking out many of the hotels & resorts plus experienced some day tours, the local culture & yummy Thai food! Her favourite place in the world is San Francisco and loved visiting Alcatraz, plus viewing the gorgeous skyline at sunset from Treasure Island. Ebony will be attending our Helloworld Frontliners conference in Fiji in November 2018 and will spend some extra time there to enjoy this beautiful country and all its charms. Her next planned holiday will be back to the USA in April and after this she is hoping to travel to India towards the end of 2019. Outside of travelling Ebony loves dogs, spending time with her family and friends and donuts! Ebony’s top travel tip: Instead of buying an adapter for every charger you need to take overseas, you can pack yourself an Australian power board with all of your charger cords and buy one overseas adapter.